Jeremy Ruman, the legal assistant to Cramer & Anderson Partner Arthur C. Weinshank, has been honored by the Town of New Milford with a 2017 Leonardo Da Vinci Award. Given to individuals who exemplify the ideals of community service and the arts, the Da Vinci Award was an initiative of a beloved local resident, the late Peter “Flag Man” Orenski, according to a story on this year’s winners in the Greater New Milford Spectrum. “It’s a real honor and it was very unexpected,” Ms. Ruman said of the award she received for her leadership as president of the Board of Directors of the nonprofit Merwinsville Hotel Restoration, Inc. The recognition comes with a medal and a plaque, which were presented June 10 at the New Milford Historical Society & Museum to Ms. Ruman and fellow Da Vinci Award recipient, Lisa M. Martin, a guiding light for the Loaves & Fishes Hospitality House. 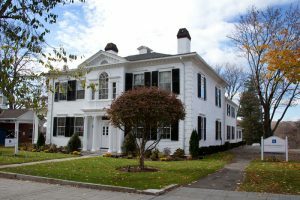 The Merwinsville Hotel, located along the Housatonic Railroad in the Gaylordsville section of New Milford, was a meal and rest stop that opened in 1843, according to the Restoration’s website. Visiting the former hotel today offers a sense “of what it was like 170 years ago as passengers stepped off the railroad on their way from Bridgeport, Connecticut, to summer homes in Pittsfield, Massachusetts,” the website explains. “He really gathered the neighborhood together to save it,” Ms. Ruman has said of her father. Now, she leads the Restoration board and her sister, Jennifer Haase, is Vice President of the Board for the all-volunteer effort. The building was painted, and the porches were repaired, last year. Now attention is turning to the third floor ballroom, where a contractor will be doing structural work. “It’s a really big project,” said Ms. Ruman, explaining that the work will address an issue that has caused the roadside façade to bow out because of the weight of the roof. “There’s a whole lot more we would like to do and it just comes down to money,” Ms. Ruman said. Those who would like to experience the Merwinsville Hotel can take one of the Sunday tours being offered this summer from July 9 to Aug. 27, or join the Restoration supporters at the Fall Potluck Dinner on Sept. 8. See the events page for details. The next big event at the Restoration is the Columbus Day weekend art & fine crafts show. There’s also an annual holiday show in December and a Spring art & fine crafts show. The Merwinsville Hotel is located at 1 Browns Forge Road in Gaylordsville. The phone number is (860) 350-4443 and the website is merwinsvillehotel.org. Ms. Ruman handles all administrative aspects of Attorney Arthur C. Weinshank’s Tax Law, Estate Planning and Elder Law practice, and devotes a substantial amount of time to interacting with his clients. She may be reached by email at jruman@crameranderson.com or by phone at 860-355-2631, ext. 132.